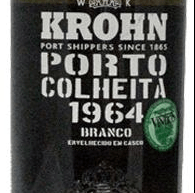 Wiese & Krohn of 1964 white Port wine. A very interesting and unique, single-year, very old white Port. The 1964 White Colheita Port has a deep, golden amber colour with a green olive tint. Traditional grape varieties are sourced from Krohn's own vineyards, and supplemented by fruit from neighbouring farms working in partnership with Krohn. Here old vines are planted in schistous soils. Fermentation in temperature controlled stainless steel vats, which is interrupted by the addition of grape spirit to preserve a certain degree of natural sweetness. This wine is a blend of different grapes, vineyards and vintages. Maturation - aged for 2 to 3 years in large, old oak barrels. The intial aromas are as wonderful as you would expect from such a rare delicacy, brimming with green herbs, particularly fennel and celery and a warm ginger spiciness. There are also some developed nutty/ creamy characters hinting at nougat.The palate starts off with intense sweetness, followed up by beautifully balanced acidity. Long finish.